When the official portraits of former President Barack Obama and Mrs. Michelle Obama were unveiled on Monday, February 12, at the Smithsonian National Portrait Gallery in Washington, DC, all the world had something to say. Love them or hate them, one thing is sure: nothing about the portraits was in keeping with the traditions of the White House. As the first African American President and First Lady, the Obamas brought vibrant colour and dynamic style to the conventional representation of supreme power. 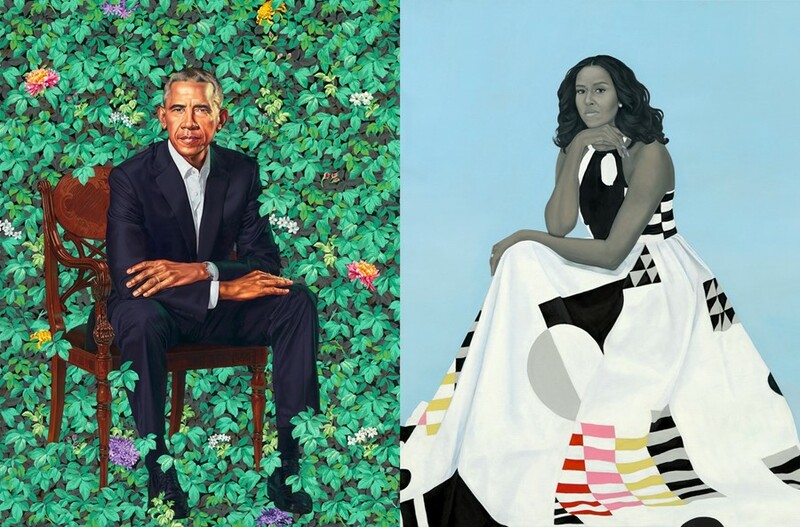 The choice of Kehinde Wiley, 40, and Amy Sherald, 44, was a political as well as aesthetic act, reinforcing the Obamas’ ongoing commitment to African American artists that includes the inclusion of Alma Thomas and Glenn Ligon in the official White House art collection. With an intrinsic understanding of legacy, the Obamas know that political progress, like art, requires us to step ahead of the status quo and recognise that it may take them time to catch up. To some, the work of Wiley and Sherald might seem avant-garde but within the realms of art, they are very much of the here and now. 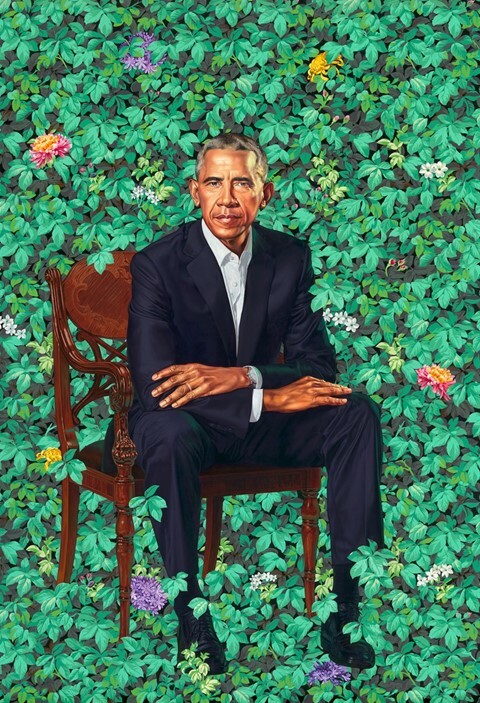 In Wiley’s portrait of Barack Obama, we step inside a garden of earthly delights, where the nation’s first African American president is seated in an elegant wooden chair set against luscious green foliage and a smattering of flowers that include blue lilies for his father’s native Kenya, jasmines to symbolise Hawaii, of his childhood, and chrysanthemums, the official flower of Chicago, where he launched his political career. The ground is invisible so that while he is seated, he is also floating in this ethereal realm, a prescient reminder that we sit on the tipping point as climate change transforms biospheres around the earth. "Barack Obama" - 2018© 2018 Kehinde Wiley, on display at the National Portrait Gallery, Smithsonian Institution. Obama leans forward, arms softly crossed with elbows resting on his knees, his legs slightly ajar, as tendrils from the garden delicately encircle his ankles and graze across the chair. Set within this lush landscape, Obama is both regal and relatable. He wears a dark suit, but no tie and the top two buttons of his shirt are open while a watch peeks out of his cuff. His expression is direct and unwavering, and his eight years in office are etched in the lines on his face. He is looking and listening to both towards the present and the future. By using pictorial styles and iconic motifs that we know and revere, Wiley reveals the inherent power of portraiture to transform the way we see and think, creating an inclusive portal in which those who have been marginalised, maligned, or ignored, can now see themselves. While the halls of American power and wealth have been summarily defined by the exclusion, exploitation, and oppression of all who were not white, the paintings by Wiley and Sherald – just like their subjects – have changed the game. 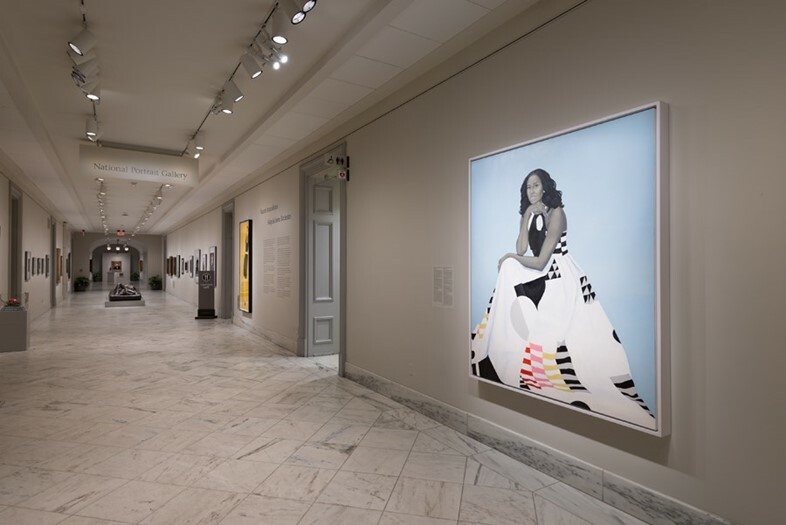 "Michelle LaVaughn Robinson Obama" - 2018Amy Sherald, on display at National Portrait Gallery, Smithsonian Institution. As Michelle Obama, whose great-great-grandparents were slaves, reminded the nation at 2016 Democratic National Convention: “I wake up every morning in a house that was built by slaves” – a truth that can never be erased, diminished or revised. Yet truth, in and of itself, is simply a fact; it is what we do with these truths and how we use them to empower ourselves that matters most. Amy Sherald’s portrait of Michelle Obama speaks to this. Mrs. Obama, who is one of the most photographed and scrutinised public figures of our time, has collaborated with Sherald to show the world exactly how she wishes to be remembered. In her paintings, Sherald uses greyscale to address the issue of race, a construction that predates the establishment of the United States by nearly a century. The concept of “race” first took root in 1691 when the leaders of the Virginia colony invented a new group of people, legislating “whites” into existence. Under these new laws, “whites” were given rights that “blacks” were systematically denied so that the ruling class could wield political and economic power over all peoples of the peasantry. Here, Michelle LaVaughn Robinson Obama, as the painting is formally known, denies people the opportunity to see race on their terms; by working with Sherald, she calls the shots, subverting expectations at every turn. The use of greyscale speaks to the traditions of photography, recalling some of the first portraits of African Americans, made possible through the advancement of technology before and after the Civil War – whereas traditional portrait painting favoured the white gentry who had money to burn. Like her husband, Mrs. Obama’s gaze is exceedingly direct, meeting the gaze of the viewer full on. But unlike him, her years in the White House have made her even more radiant. Though her visage does not have the verisimilitude that Wiley gave to her husband, it suggests a woman who knows herself well enough to maintain a distinction between her private and public selves. Sherald’s subjects, always beautifully garbed and exquisitely coiffed are presented in front of pastel backgrounds that, like the portraits of Barkley L. Hendricks, make you want to look. 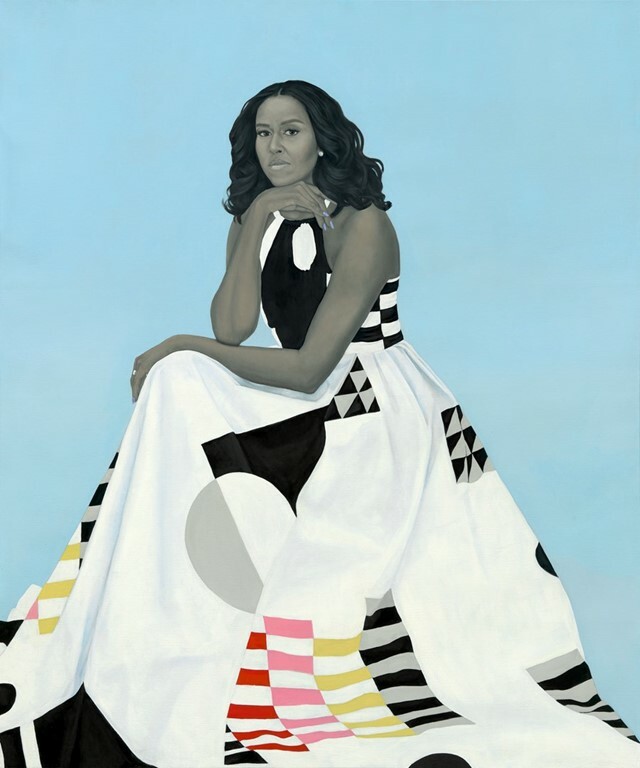 In her portrait, Mrs. Obama has donned a Michelle Smith for Milly gown that evokes the designs of Piet Mondrian and the African American women of Gee’s Bend, Alabama, who made some of the nation’s greatest quilts. The portrait of the former First Lady in the Recent Acquisitions GalleryNational Portrait Gallery, Smithsonian Institution. Mrs. Obama, who wore an Isabel Toledo suit when Obama was sworn in, has once again chosen an independent female designer based in New York City. But where the Toledo design was exquisitely detailed with thin layers of cream silk radzimir and cloudlike silk netting, the Smith down was made of stretch cotton poplin, a worker’s fabric – with pockets to boot. The Obama official portraits are about the long game. They are not just speaking to us who have known them throughout their tenure and will watch them as they move forward through life, but to those who will never share the planet with them at the same time. By working with Wiley and Sherald, the Obamas are speaking the language of art, casting their legacy as free and independent thinkers who broke the mould.